For racers and performance enthusiasts who want high quality plumbing that's lighter and easier to assemble than traditional braided steel hose, Russell ProClassic hose is the perfect choice. 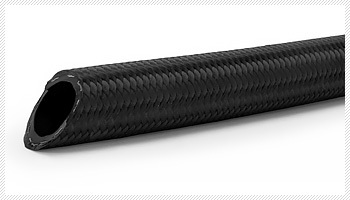 It features a lightweight nylon fiber outer braid with a CPE inner liner, and a maximum pressure rating of 350 psi. It is capable of handling nearly every plumbing task on your car and is safe to use with fuel, oil, or antifreeze. If a traditional looking hose is your choice, Russell ProClassic II is the answer. 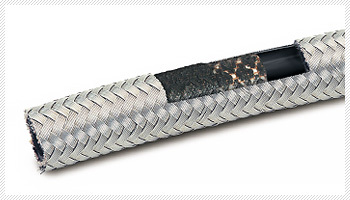 ProClassic II hose features an all-black nylon fiber braided outer cover over a Chlorinated Polyethylene (CPE) synthetic rubber inner line for abrasion resistance. The CPE inner liner incorporates a bonded multi-braid stainless wire that improves bend radius with less possibility of collapsing when routing hoses in tight areas. ProClassic II hose has a maximum working pressure rate at 350 psi and is safe for use with fuel, oil and antifreeze. To complement this new hose, we have a complete line of ProClassic black/silver and ProClassic II all black anodized hose ends and adapter fittings available. For competition applications where reduced weight is needed, use our lightweight ProClassic Crimp-On hose ends. For maximum protection and reliability, choose Russell ProFlex performance hose. Constructed with a stainless steel outer braid that resists abrasion and corrosion, ProFlex hose has a reinforced Chlorinated Polyethylene (CPE) synthetic rubber liner with a nylon inner braid that will not collapse under extreme heat, yet is extremely flexible. Superior ProRace hose has the same features as ProFlex but with a specially formulated CPE synthetic inner liner that is embedded with a partial coverage stainless steel inner braid, then bonded together by a full coverage stainless outer braid for superior strength. 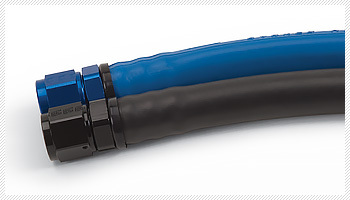 Powerflex Power Steering Hose Ends with Endura finish are available in three different AN sizes (-6, -8 and -10). These hose ends are suitable for high pressure power steering use and are corrosion resistant. Russell Specialty Hose Ends, are the perfect answer for several of your specialty plumbing needs. 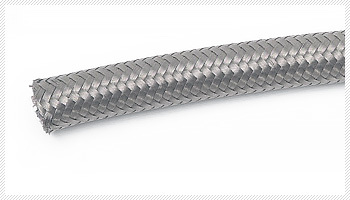 The Full Flow Swivel Pipe Thread Hose Ends allows the connection of fuel and oil lines with out any additional adapters simplifying the hose assembly. When plumbing your dry sump system by utilizing the Full Flow Swivel Dry Sump Hose End the additional adapters are eliminated saving time and money. The Full Flow Forged Swivel Hose Ends are manufactured from a superior strength and durable forged aluminum for the tight and unique tight engine compartment. Download a printer friendly Warranty and Installation PDF (you will need Acrobat Reader® in order to view this PDF). If you do not have this installed you can download it by clicking the icon.